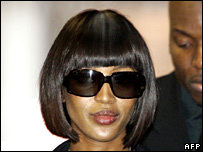 Supermodel Naomi Campbell has pleaded guilty at an American court hearing to a charge of reckless assault. She made the admission in a plea bargain with prosecutors at Manhattan Criminal Court in New York. Campbell has been appearing before the court over allegations that she assaulted her housekeeper by throwing a mobile phone at her. Campbell was sentenced to five days community service and ordered to attend an anger management course. The model was accused of hitting Ana Scolavino following an argument at her apartment in New York. That was an accident because I did not intend to hit her. She was also ordered to pay medical bills of $363 (£185) for her injured housekeeper who needed four stitches after the incident. Campbell had admitted in court to throwing the phone in her Park Avenue apartment, but said she did not intend it to hit Mrs Scolavino. She said: "I am advised that Ana was hurt, and I am deeply sorry about that." Campbell, who appeared in court in a pencil skirt, 4in heels and a Louis Vuitton jacket told the judge: "I have an apartment at 500 Park Avenue. "Ana Scolavino was an employee of mine. During the morning of March 30, 2006, I threw a cellphone in the apartment. The cellphone hit Ana. That was an accident because I did not intend to hit her." Campbell's lawyer David Breitbart asked the judge that she be sentenced to indoor community work rather than punishment such as sweeping the streets, saying it was with his client's safety in mind. Judge Robert Mandelbaum said he would take note of Mr Breitbart's request. Assistant District Attorney Shanda Strain said: "If that's what is available at the time she goes to do the community service that is acceptable." Campbell later released a statement, saying: "I pleaded guilty to a misdemeanour in court today. That's the best way I know to say I'm sorry to Ana. "I accepted responsibility and I'm prepared to take my punishment. But I'm not going to let this incident define me. "The past is the past. My future holds great things and I'm getting on with my life."